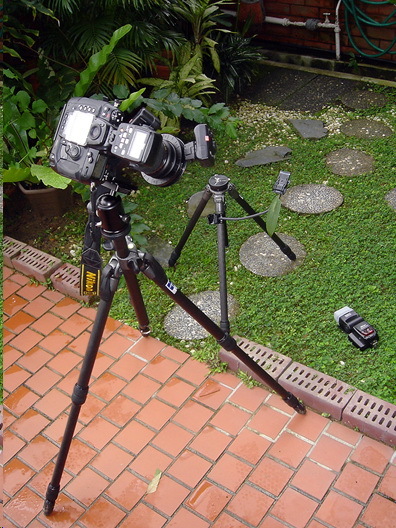 In my earlier article, we introduced a variety of image-capturing equipment that can take pictures of butterflies. These range from a humble smartphone with a camera, to a wide spectrum of point-and-shoot digital cameras, to the high end Digital Single Lens Reflex (DSLR) cameras with full-frame or APS sized (cropped frame) sensors. In Part 2 of the series, we leave the lower end digital cameras aside, and assume that you have now jumped onto the DSLR bandwagon and are looking for the appropriate magnification devices to start you on your journey to butterfly photography. 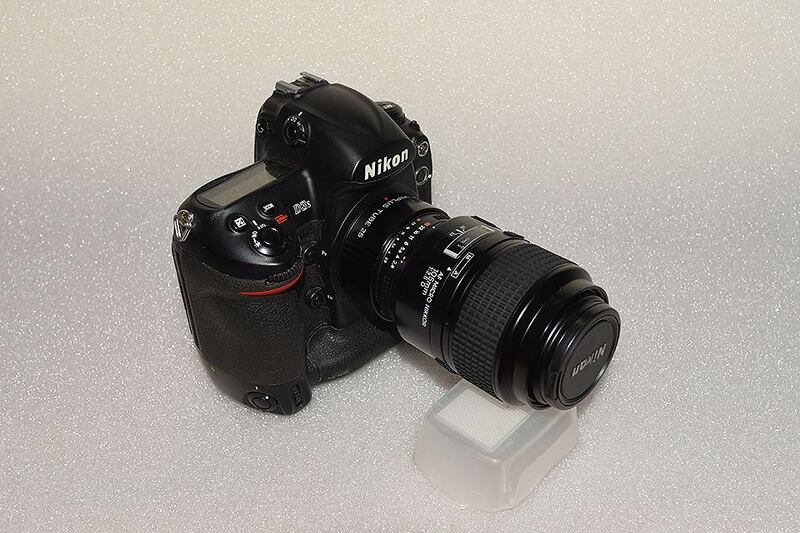 As you may have already been researching on the internet, the range of equipment to couple with your DSLR camera body can be quite mind-boggling. Learning more about each different device, you may end up having more unanswered questions! Firstly, let us define what we typically refer to as "macro photography" with reference to butterfly photography. The term "macro" has often been loosely used to market a whole range of equipment, ranging from general purpose lenses, close-up filters to the true specialised macro lenses. So let us define the basic parameters of what constitutes a good macro device. A macro lens or any photographic combo in macro photography begins with a one-to-one ratio (depicted frequently as 1:1 ratio). So what is a 1:1 ratio? 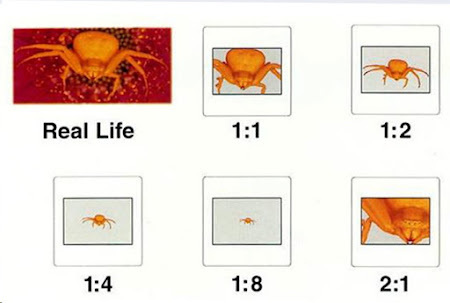 A lens or a combination of devices attached to any lens that can achieve a 1:1 ratio means that the lens or lens combo is "capable of projecting the real life size of a subject onto the sensor of the camera body". Not all macro lenses nor those which are labelled as "macro lenses" are capable of this 1:1 ratio. For example, the Sigma 18-200mm F3.5-6.3 DC Macro OS HSM is touted as a "macro" lens, but if you look at the technical specifications of the lens, the maximum magnification of the lens is only 1:3. This means that you can only get one-third of the actual size of a subject on the sensor at the minimum focusing distance. 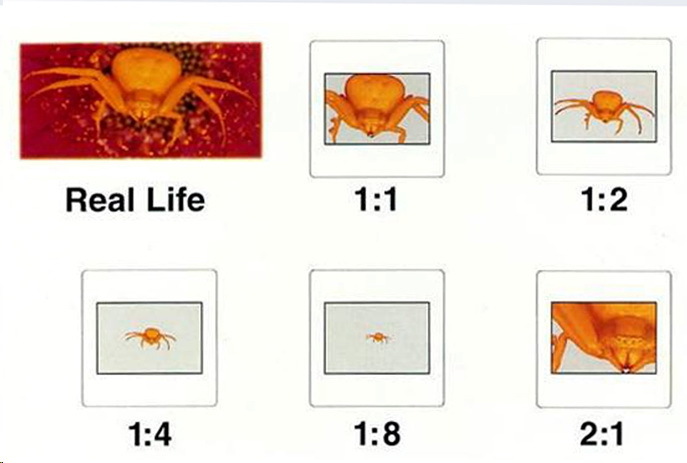 The slide above shows the various magnification ratios from 1:1 to 2:1. So when you pick an all-in-one "macro" lens for your butterfly photography, take a look at the technical specifications of the lens and check to see what its maximum magnification is. 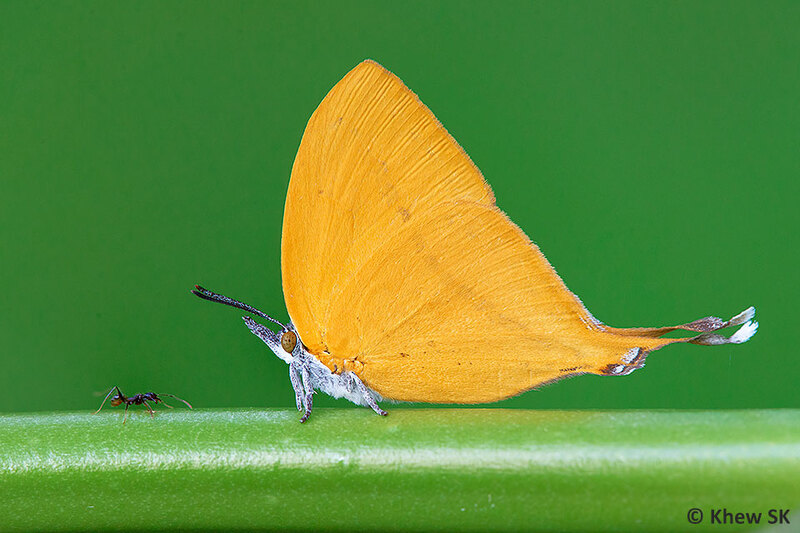 Whilst a non 1:1 lens works for general butterfly photography of larger butterflies, you will be hard-pressed to get the details and actual size of a small butterfly with a lens that has a magnification ratio that is 1:2 or 1:4. This is particularly so, when the subject itself is smaller than the sensor of your camera. For enthusiasts who have bought a basic DSLR with a kit lens (e.g. 18-55mm), it is possible to get 1:1 magnification ratio (or even more) by simply purchasing a reversing ring and attaching it to your camera body with the lens reversed. A reversing ring is essentially a simple device that has the camera mount on one side, and screw mount on the other. This allows your lens to be mounted backwards onto your camera. This is probably the cheapest option you have, to get larger-than-life images with your existing equipment, without having to spend exorbitant amounts of money on specialised equipment. However, be aware that you lose all electronic controls over aperture, AF and so on, and you will have to manage everything in manual mode. The depth of field is also very shallow, and you may not get the quality of image that you hoped for. 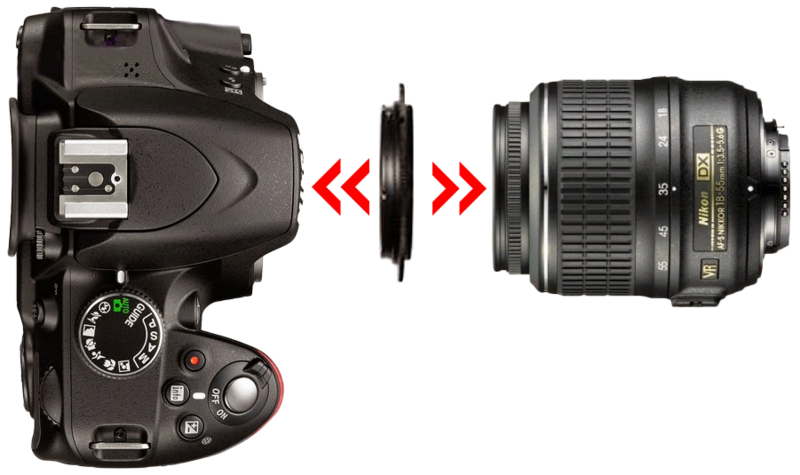 A basic article describing how to use a reversing ring for Canon cameras can be found here. Equally cheap and probably as effective in getting higher magnification on your subjects, is combining two lenses, with one of them reversed. This is possible by using a male-to-male filter coupler. This allows two lenses to be attached facing each other. Combining two short focal length prime lenses give the best results. The formula for calculating the magnification that you can get from stacking lenses is focal length of prime lens divided by focal length of reversed lens. Some explanation on the use of stacked lenses can be found here. Next device up the list is the extension tube. An extension tube works by creating more space between the lens and the digital sensor. By "extending" the lens away from the camera body, you enable yourself to get closer to the subject. As you increase the size of the extension tube, you increase the ability to move even closer. The relationship between the focal length of a lens and the dimension of an extension tube determines how close you can get to a subject while achieving focus. The closer you can get, the greater the magnification. For many lenses, the minimum focusing distance can be reduced by attaching an extension tube (or several extension tubes in tandem) to increase the magnification of the lens. This allows the photographer to go in closer to get a magnification ratio that would otherwise not be possible just with the lens. 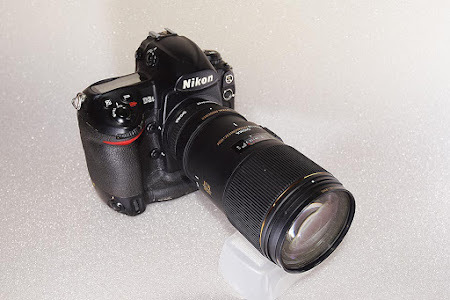 However, the lens can no longer focus to infinity and you will have to move in and out to get within the focusing distance of the lens with the extension tube combo. If you use extension tubes, buy those with the electrical contacts that still allow the camera body to communicate with the lens. 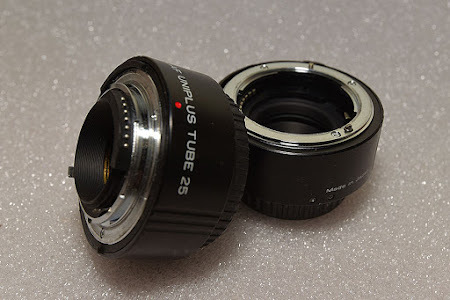 Third party extension tubes are adequate, and these often come in a set of three - 12.5mm, 25mm and 50mm tubes, and cost in the region of SGD$180-$250. 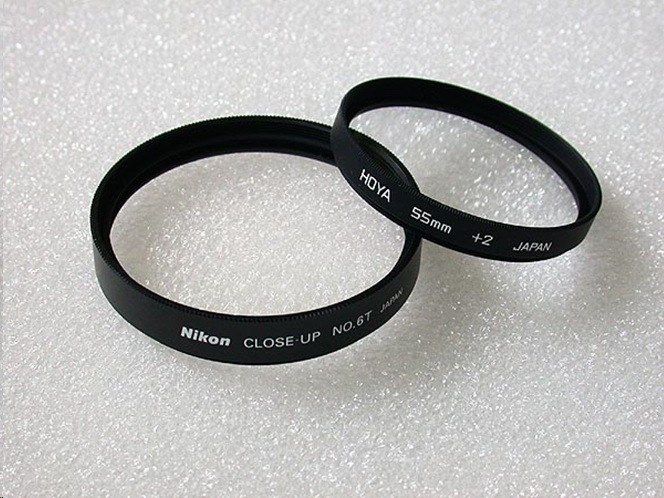 As extension tubes have no glass elements in them, there is minimal or no effect on the optics of your existing lenses. Additional information explaining the use of extension tubes, including a magnification ratio calculator can be found here. 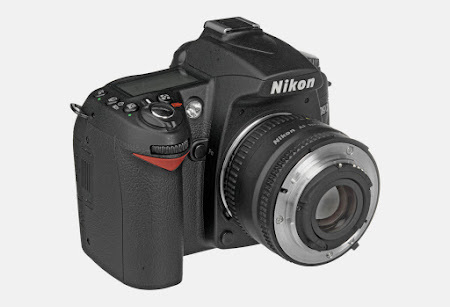 The next device that a photographer may want to consider, is a close-up filter. In very layman terms, this is equivalent to using a magnifying glass in front of your eyes to enlarge something that you are looking at. The close-up filter screws in front of your lens, and enlarges the image onto the camera's sensor. 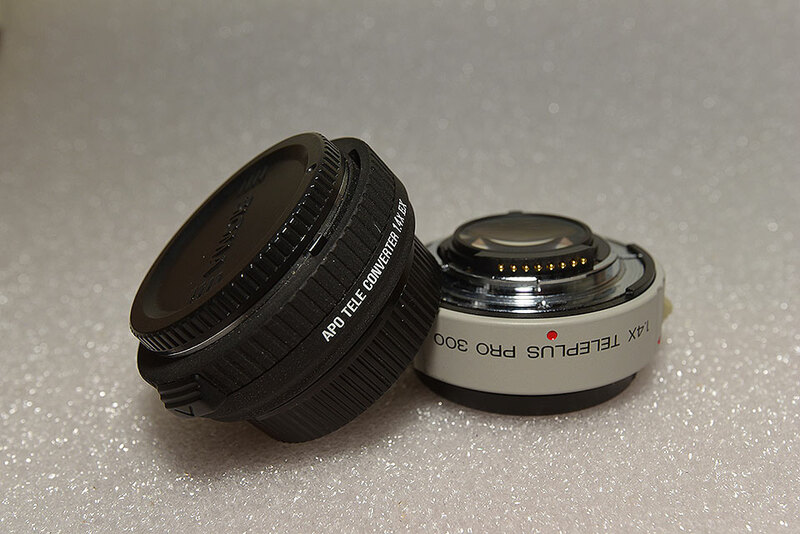 As there are many types of such close-up filters with a wide range of diopters, choose the dual element types as these correct for optical aberrations and give you decently sharp images. Slightly further up on the list of magnification devices (cost-wise), is the teleconverter (or tele extender). This is basically a magnifying lens that is attached between your camera body and the lens in use. Teleconvertors come in various magnifications like 1.4x, 1.7x, 2.0x and even up to 3.0x. 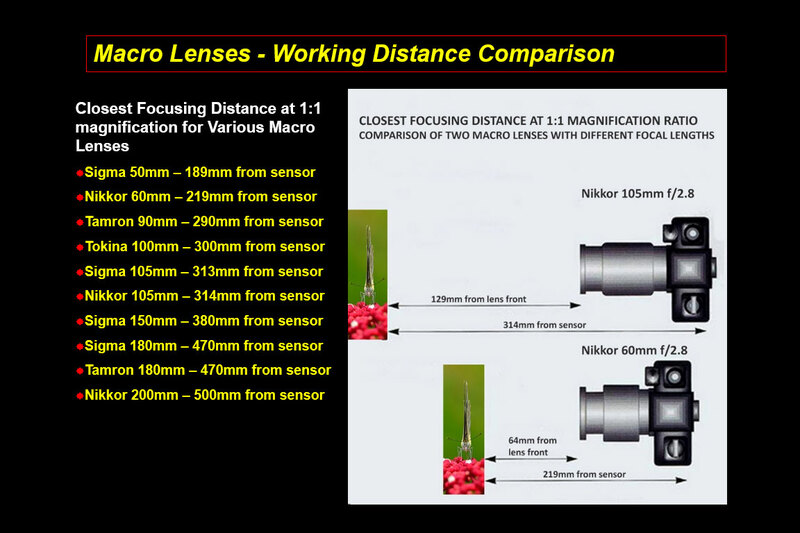 A 2.0x teleconvertor would enable a macro lens that does 1:1 magnification the ability to do 2:1 at the same working distance or 1:1 at twice the working distance. The downside of using a teleconvertor is that putting additional glass elements between the primary lens and the camera's sensor implies that there may be some image degradation. Furthermore, the amount of light reaching the sensor is reduced and you will have to increase the aperture to get the correct exposure. A good branded teleconvertor may also set you back about SGD$400 or more! The unique features of using each of these magnifying devices mentioned above can also be combined - i.e. using extension tubes with teleconverters, or teleconverters with close up filters or even all three! However, the combo may be heavy, lopsided and impractical for shooting butterflies in the field. 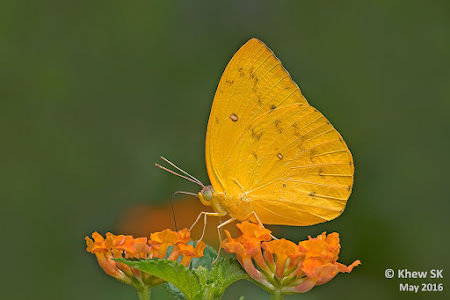 The "ideal" lens for photographing butterflies is the dedicated macro lens. Usually more costly than standard lenses, the macro lens is designed for close-up work and most can achieve a 1:1 magnification ratio. The focal lengths of macro lenses can range from 50mm to a high of 200mm. Remember that all these can achieve 1:1 magnification ratio. The longer the focal length of the macro lens, the better the working distance between you and the subject. 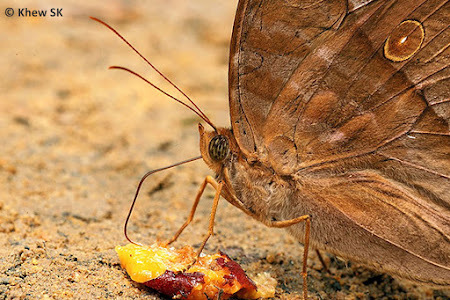 In the case of butterflies, which may be skittish, a longer working distance makes a difference between getting a good shot of the butterfly, or getting a good shot of the leaf on which the butterfly sat - after it had flown off! 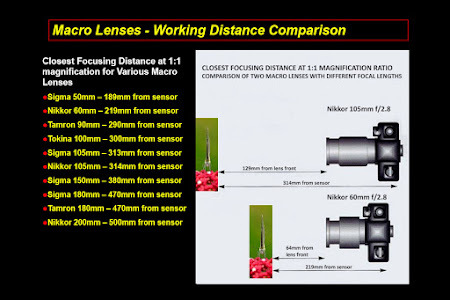 A table showing a list of the popular 1:1 macro lenses and the working distance (the distance between the subject and the camera's sensor at the closest focusing distance). Note that the choice of lenses will also determine how much you can afford to spend on these specialised lenses. 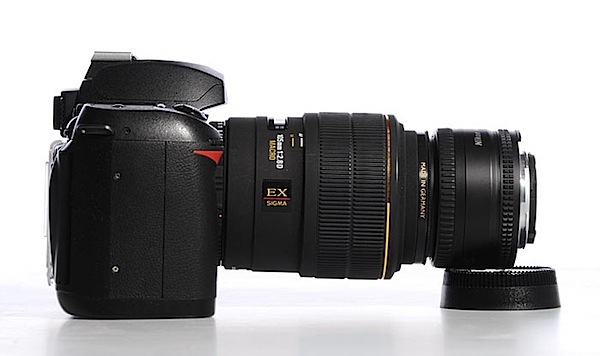 The longer the focal length of the lens, the higher the price. 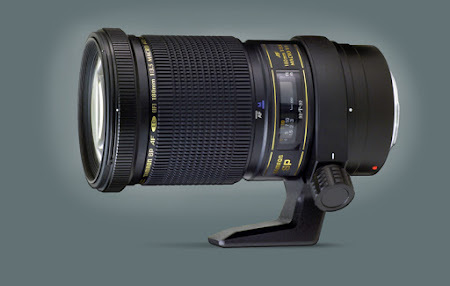 The cost of a dedicated macro lens can range between SGD$600 to SGD$2,200. 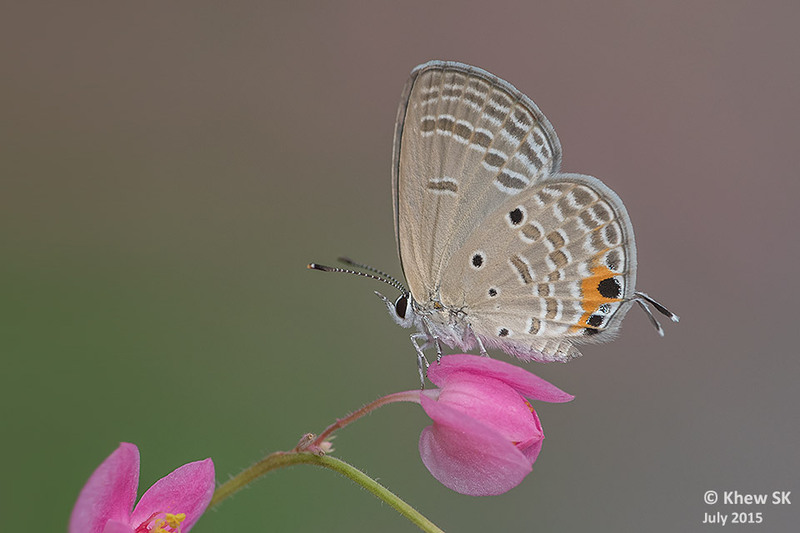 Many ButterflyCircle members use the Tamron 180mm macro lens. This is a very capable lens with accurate colour rendition and bokeh. 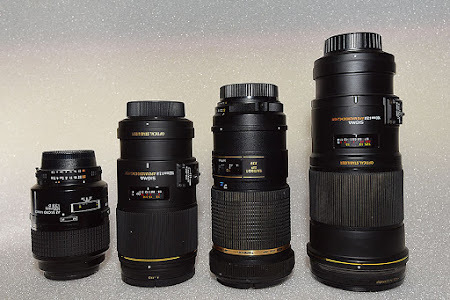 It is relatively light compared with the 180-200mm range of macro lenses from Canon, Nikon and Sigma, although the AF could be better. However, it is an excellent workhorse, robust in design and is a good all-round lens for butterfly photography. Shorter macro lenses are less expensive and those in the 90-100mm range are quite usable for the more cooperative butterflies. Anything below these focal lengths for macro lenses would not be too practical for shooting butterflies as you will have to go really close to the subject and more often than not, scare the butterfly off before you can take a shot. In recent years, new macro lenses have incorporated gyro-stabilisers into the lenses (IS, OS, VR, VC equivalent) to help deal with motion blur. This feature tends to increase the weight and dimensions of the lenses, and obviously, the price. And there you go, a very basic article to help photographers who would like to shoot butterflies, decide on the variety of devices that are available to start off their journey in butterfly photography using a DSLR system.